So you tried to get a Wii U last week but failed miserably, and now you just simply want one for free? Burger King might be able to help. This post is probably a little late considering this contest is nearly over, but it’s still worth your time. 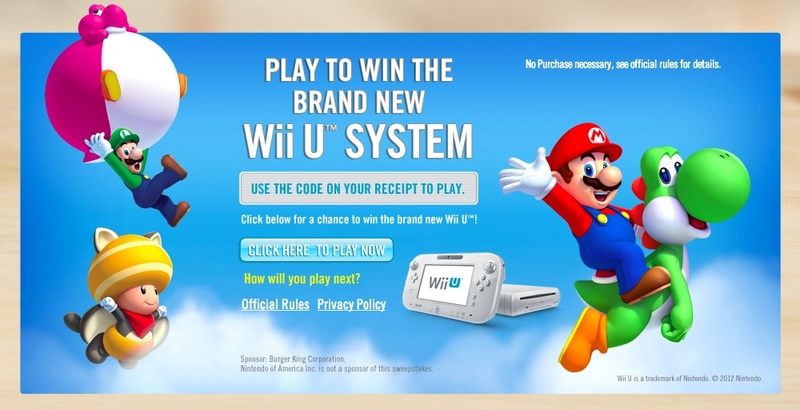 Now until December 2nd, Burger King has a contest to give away a seemingly arbitrary number of Wii Us – 490 in all. All you have to do is eat some Burger King and use your receipt to plug in some info on their contest website. Better yet, if you don’t want to eat Burger King, you still have the ability to win because this is one of those “No Purchase Necessary” give aways. To play for free, simply go to the contest site and sign up for a free code. It is my understanding that you can get one free code every day. Right now, that means you only have about six days to try and win a Wii U. You do have to supply them with an email address, so choose your throw-away Hotmail account you made in college before Gmail existed lest your inbox be bombarded with burger news.